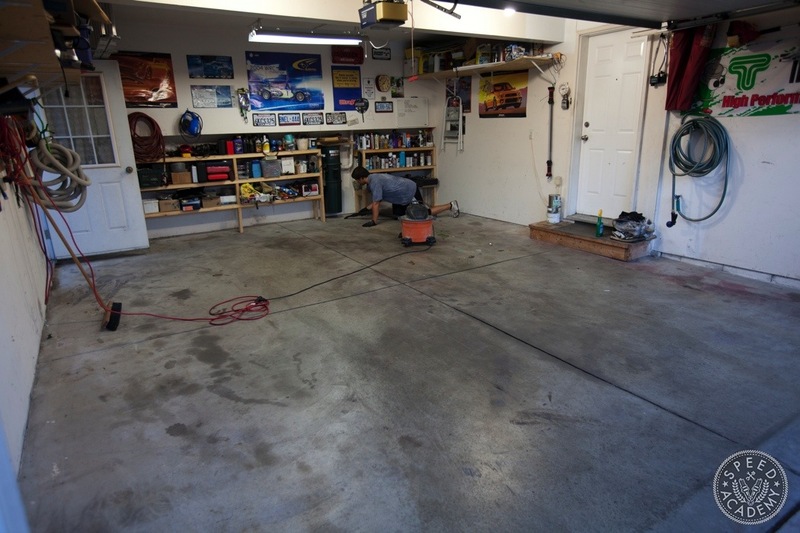 Garage Flooring and Epoxy, is it worth the Investment? 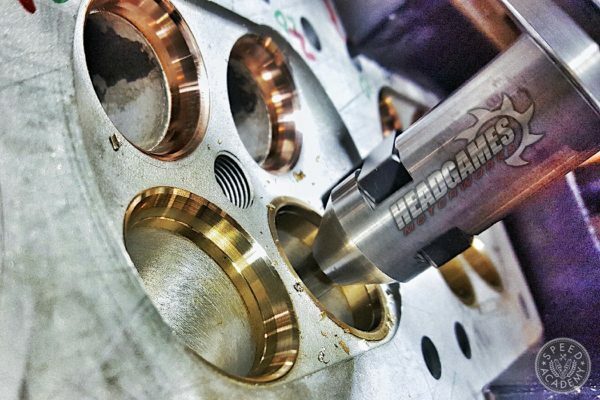 The lead photo in this article has gotten a lot of attention and compliments but not because of the car, even though its pretty awesome ( I may be biased ). The checked patterned floor is actually the focal point of many inquiries and questions. What kind is it? How hard is it to install? Is it expensive? And does it last? This quick write up will answer most if not all your questions about the flooring and my experience installing it. 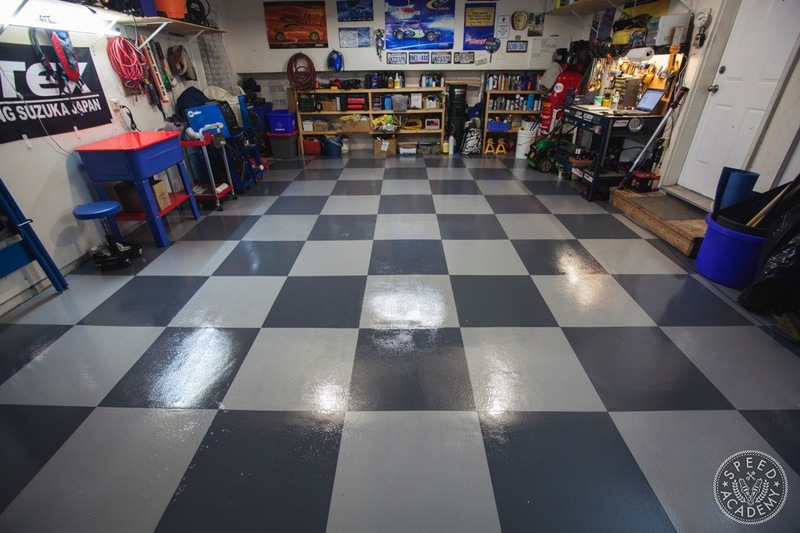 But first, there are many types of floor coatings and stick on, lay flat applications out there. The product that I used is called G-Floor RaceDay Peel & Stick Tile by BLT (Better Life Technology). 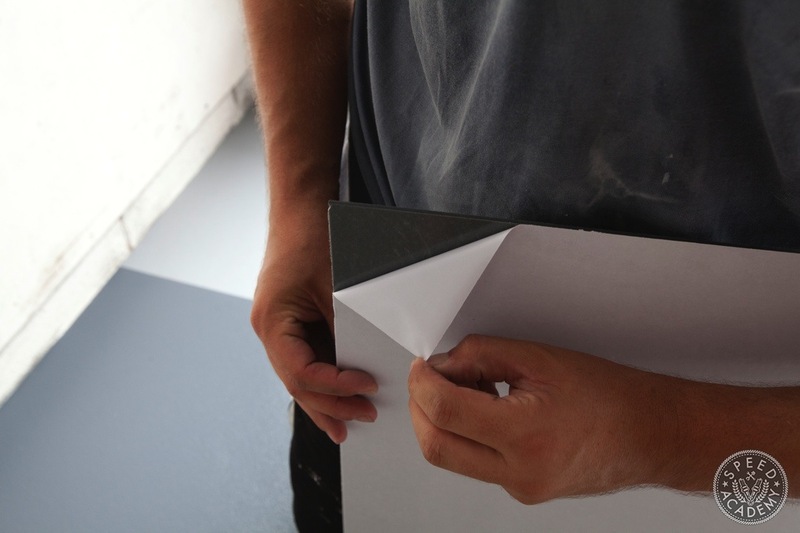 It’s a very simple to apply tile that uses an adhesive backing to permanently adhere to your concrete floor. WalMart actually sells the 24″x24″ 10-pack RaceDay Peel & Stick tiles for $95 so if you know your garages square footage you can quickly figure out how much the materials will cost you. I recall we used about 9 packs so under $1000 for the entire garage. While it’s not a cheap endeavor it’s something that will last a long time so the upfront investment seems to be worth it. There are many other benefits to laying a floor like this down other than it looking good. 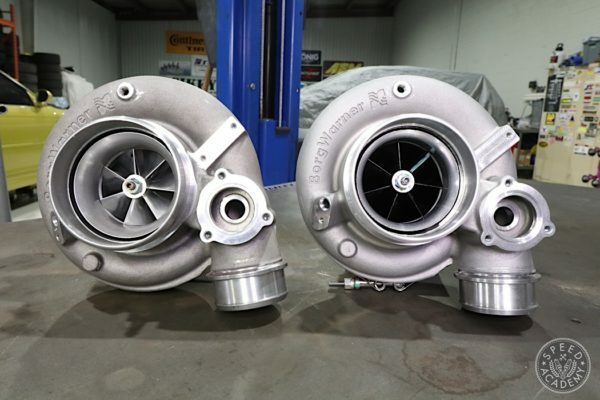 First and foremost is the reduction in noise and improved insulation. 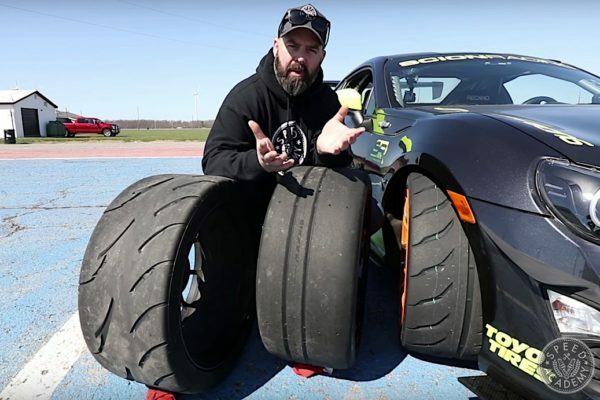 If you’ve spent any long periods of time laying underneath a car on bare cement you know how taxing it can be on the body. As soon as I installed the tiles I noticed that there was just enough cushion to make a difference when you’re crawling around on it. That’s with the epoxy over it (I’ll get to that in a minute) so without it, there’s even more forgiveness to the tile. During the winter is when the tiles really proved their worth insulating the cold cement floor. With a small heater, I could heat the garage up to a comfortable temperature to work in fairly quickly. Years past, it was always a struggle to wrench on the car without a high capacity heat source. You’d be surprised how well this floor insulates now. So what about this epoxy or as BLT calls it Top Coat. 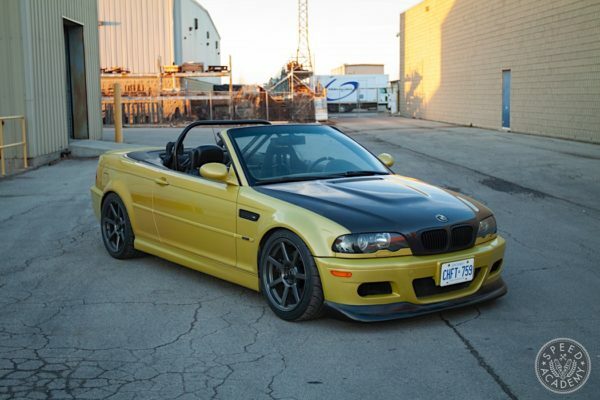 If you regularly work or fiddle with your car then I highly recommend applying it. Top Coat seals and protects the tiles while giving the floor that wet look finish. 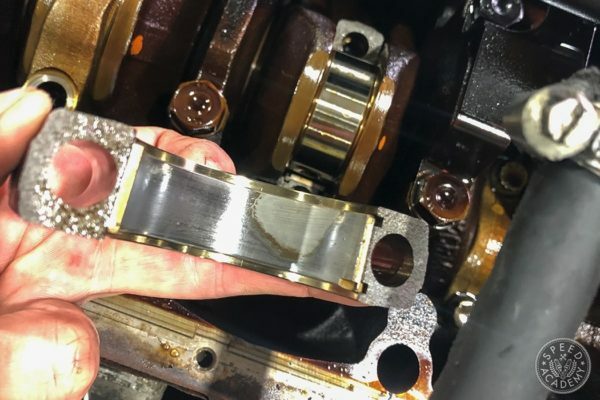 On top of that it makes cleaning up oil, water, and even dirt super easy. 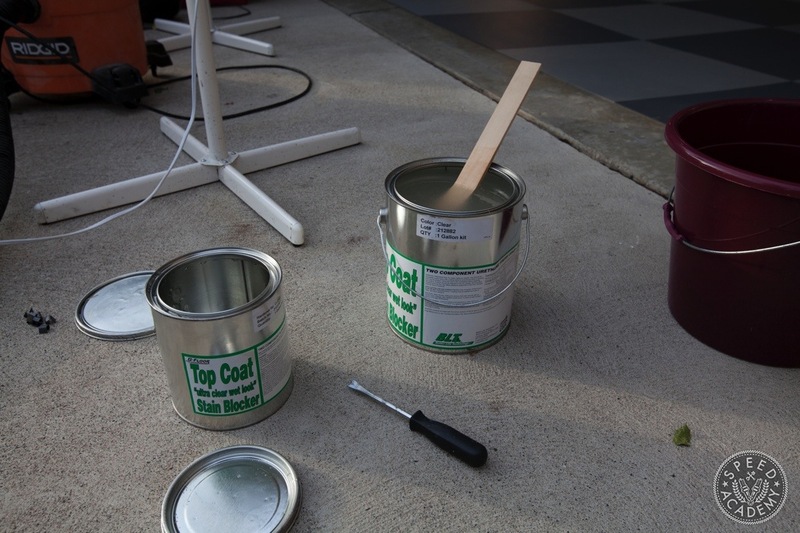 Unlike cement that absorbs oil, the epoxy repels it so it wipes right up. A gallon of this stuff sells for about $150 but in my opinion is well worth the investment especially since you’ve already spent a considerable amount on the tile itself. I needed more than I originally thought so budget for about a gallon and a half (or two to be really safe) to do a floor my size, 550 square feet. There are epoxy floor coatings out there that apply directly onto the cement so if you don’t want the tiles than that’s always an option but consider the advantages that I already mentioned about the tiles. If you live anywhere it gets cold then I think they’re worth every penny. Either way, it’s all up to your budget and time. So what about the installation? It seems simple enough, just peel some tiles and stick ’em on. You’d be correct, that part is very simple. 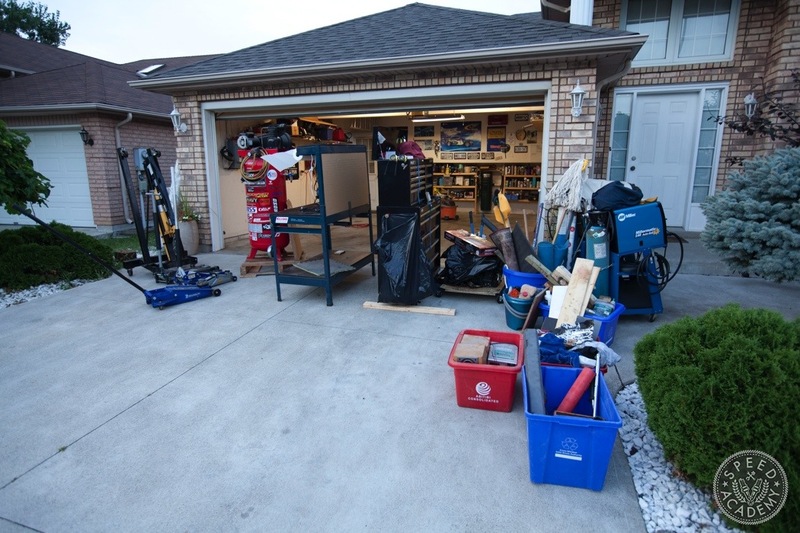 However, if your garage is filled with tools, car parts, cans and all sorts of other garage type items then that’s the more laborious and time consuming task. It’s a considerable amount of work to remove it all not to mention where to keep it as you work on the floor which, will be a multiple day affair. As you can see, we moved everything out into the driveway and wrapped it up with tarps overnight. It’s a bit sketchy because you hope no one will come along at night and steal your stuff but it’s a risk we were willing to take. A fenced in back yard is an ideal storage location if you’re worried about theft. Prepping the cement floor is critical, any debris, oil stains, dust, etc. will hinder the tiles ability to stick and we don’t want that. As my brother demonstrates here, vacuum (and sweep) it thoroughly. Wash it several times and leave it to dry overnight. You can begin to understand why this isn’t a job that is done in one night. 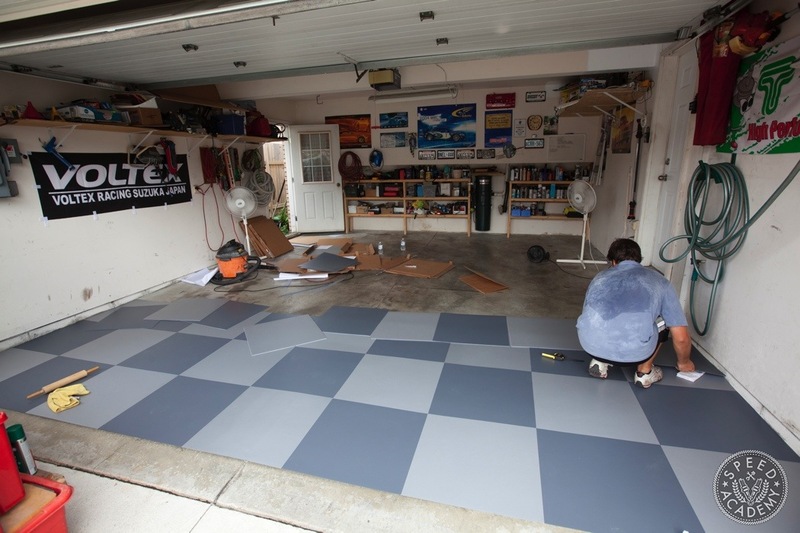 Before we stuck any tiles down we laid them out through half the garage to see how well everything lined up. Not all garages are perfectly square so you’ll need to do a bit of trimming on the sides. 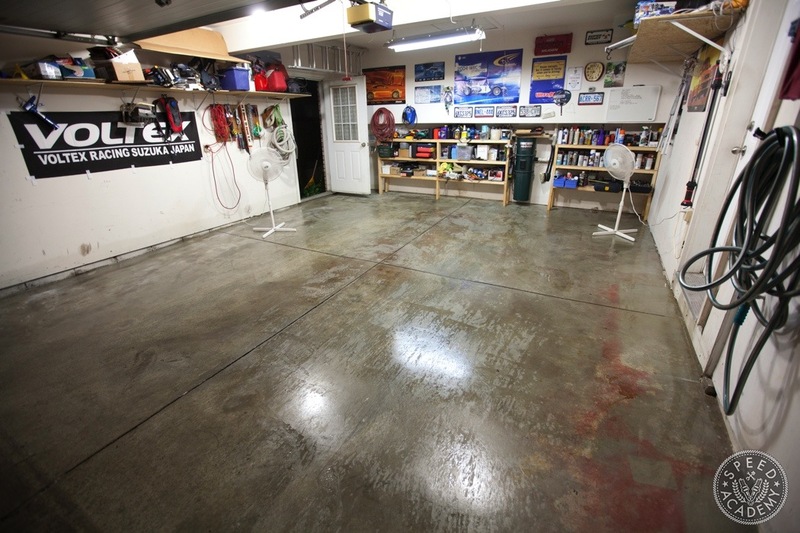 8 Comments on "Garage Flooring and Epoxy, is it worth the Investment?" That epoxy flooring looks great. I love the look of the different colored tiles. It gives the floor a really sporty look. 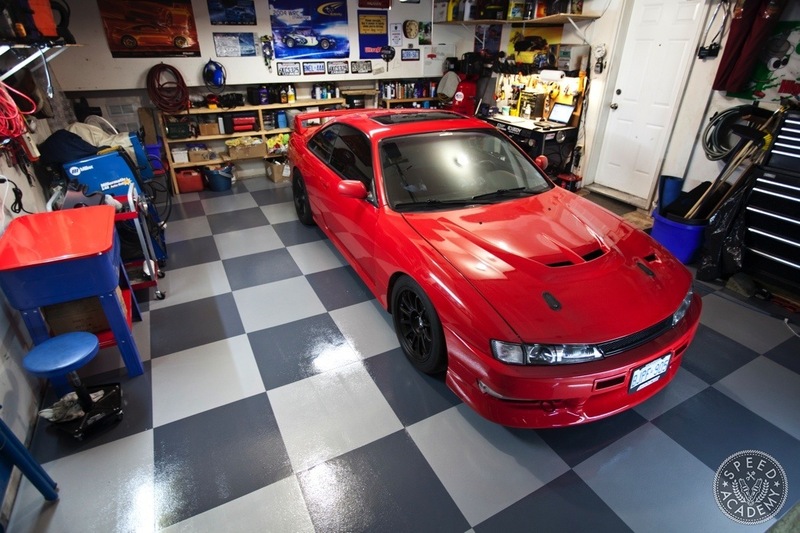 It takes a mundane looking garage and converts it over into a spot that looks much more high end. I see that you deal in epoxy floors, do you find just laying down epoxy to be as effective if not better than having the tiles down first?